Although bok choy is well known for its roots in Asian cuisine, for centuries, it has also played a role in traditional Chinese medicine. That is due to the incredible amount of nutrition contained within this delicious vegetable. The health benefits of bok choy are numerous. Bok choy is one of the top anti-inflammatory foods on the planet, which has even been shown to have anti-cancer properties and aid in digestion, and it delivers quite the punch from a nutrient standpoint. The aggregate nutrient density index (ANDI) ranks food in accordance to micronutrients per calorie. What’s amazing is that boy choy ranks third on that list, which means it is one of most nutrient-dense foods you can possibly put in your body. For those less familiar with bok choy, what do you need to know? Bok choy may look similar to celery; however, it is actually member of the cabbage family and resembles romaine lettuce. It has the botanical name Brassica rapa chinensis, and it is part of a powerful vegetable group called cruciferous vegetables. Other cruciferous vegetables include cabbage, broccoli, kale, Brussels sprouts, cauliflower, and collard greens. Bok choy is sometimes called white cabbage, but don’t confuse it with another type of Chinese cabbage known as Napa cabbage. Other names of bok choy include bok choi, pak choy, or pak choi. Bok choy will vary in size, taste, and color, including joi choi and tah tasi. The Chinese have been cultivating bok choy for over 5,000 years. In the 1800s, it was introduced to Europe, and now it is produced in California and parts of Canada. Although bok choy is available all year, it is often harvested at the end of the growing season, and because it is frost resistant, it is enjoyed throughout the winter months. It will take about two months to harvest bok choy after planting it. Let take a look at some important bok choy nutrition facts. First of all, bok choy contains some carbs, fiber, and protein; however, it is absolutely loaded with micronutrients. For instance, one cup of bok choy contains 144% of the recommended daily intake of vitamin A, 74% of vitamin C, and 72% of vitamin K. Other vitamins in bok choy include vitamin E, folate, vitamin B1, vitamin B2, vitamin B3, vitamin B5, vitamin B6, and some choline and betaine. It is also contains high amounts of calcium, potassium, iron, and manganese, and trace amounts of magnesium, phosphorus, zinc, copper, and selenium. The following detailed bok choy nutrition chart contains information for one cup (170g) of cooked and shredded bok choy. 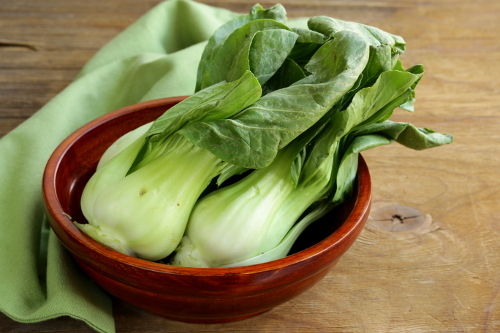 The vitamins and minerals contained within bok choy offer several impressive health benefits. For instance, the health benefits of bok choy are due in part to the many antioxidants found in this vegetable, especially vitamin A and vitamin C. Besides the traditional antioxidants, bok choy also contains phenolic acids and phytonutrients that activate various antioxidant activities. The omega-3, vitamin K, and polyphenols found in bok choy also help reduce the risk of unwanted inflammation. The vitamin C and selenium in bok choy are also great immune system boosters. The following are six other bok choy health benefits you should keep in mind. Bok choy contains antioxidant chemicals such as lutein, zeaxanthin, indole-3-carbinol, thiocyanates, isothiocyanates, sulforaphane. These compounds may help protect against colon, prostate, and breast cancers. These compounds may be effective against cancer due to their protective ability on cells with inactive carcinogens and DNA damage. Bok choy also contains brassinin, which is an antioxidative and antimicrobial substance that may also be a chemopreventive agent. Various studies have linked multiple cruciferous vegetable servings weekly to a lower risk of lung, breast, colorectal, and prostate cancers. Boy choy has various bone-promoting nutrients, including calcium, iron, magnesium, phosphorus, zinc, and vitamin K. Low vitamin K intake has been linked with a higher risk of bone fractures. While there has been some controversy, clinical studies have indicated that vitamin K also increases bone density in people with osteoporosis. Also, zinc and iron play major roles in the maturation and production of collagen. Calcium and phosphorus are also the primary minerals found in bones and teeth. The high amount of vitamin A, or beta-carotene, in bok choy make this vegetable great for protecting against cataracts and macular degeneration, which is an eye disease that leads to vision loss. The potassium and calcium in bok choy may help reduce blood pressure naturally. The potassium also helps process sodium, and this may decrease the damage sodium can have on the cardiovascular system. The vitamin K in bok choy is also important for proper blood clotting. The folate and vitamin B6 also help prevent homocysteine accumulation. Excessive homocysteine in the body may lead to blood vessel damage and heart problems. The vitamin C in bok choy helps the growth of collagen, which is needed for healthy hair and skin. This helps improve skin complexion and smooth wrinkles. The antibacterial qualities of bok choy also help combat skin infections like eczema and acne. Bok choy benefits women during pregnancy due to its folate content. The need of folate doubles during pregnancy due to the rapid growth and division of cells in the body. The consumption of high-folate foods helps prevent birth defects like anencephaly and spina bifida. When choosing bok choy at the grocery store or market, look for dark and perky leaves with white and rigid stalks. You will want to avoid wilted vegetables, and note that the better quality bok choy will be in the winter. Bok choy is a very versatile vegetable. The mild and sweet flavor and crispy texture of bok choy make it a great addition for soups, stir-fries, and braising. Many call the vegetable “soup spoon” due to the shape of its leaves. You can cook the stalks and leaves of bok choy in bok choy soup or bok choy stir-fry, or you can eat them raw in a bok choy salad. Although bok choy can be steamed or boiled, the stir-fry method seems best for releasing the flavors of the vegetable. Shredded bok choy also makes great coleslaw, and it can also be pickled to make kimchi or sautéed with garlic and ginger. You can also sauté bok choy in broth, cut and grilled with salt. You can even juice bok choy or add it to a green smoothie. Before you cook bok choy, you should separate the stalks and leaves and thoroughly wash each part. For optimal freshness, it best to avoid washing bok choy until you are ready to use it. Unused parts will stay fresh for up to six days in the refrigerator. Let’s take a look at a couple of easy-to-prepare bok choy recipes. It will give you a taste of Asian cuisine, but also provide several health benefits contained within the vegetable. Chop bok choy into thinly sliced pieces. You should have at least four cups. Peel the apple, carrot, and onion, and thinly slice. Use a peeler with the apple and carrot for best results. Place everything in a large bowl, and add the sunflower seeds, sesame seeds, and raisins. In a small bowl, whisk together the oil, orange and lime juices and zests, vinegar, maple syrup or honey, coconut aminos or soy sauce, pepper, salt, and garlic powder. Pour the dressing over the salad, and toss to combine. Serve immediately, or let the flavor enhance in the refrigerator for two hours before serving. In a large skillet, heat the olive oil over medium heat, and add ginger and garlic. Cook for about a minute, and then add bok choy and tamari or coconut sauce. Cook for another three to five minutes or until greens become wilted and the stalks are tender. Season with salt and pepper to taste. Bok choy delivers one of the highest levels of nutrients per calorie compared to other foods. However, there is a potential concern of bok choy that you still need to know. For instance, bok choy contains goitrogens, which are chemicals that may interfere with thyroid hormone production. Some research once suggested that people with thyroid dysfunction may have a problem with cruciferous vegetables and other goitrogenic foods, which may affect iodine metabolism, inflammation, and overall thyroid malfunction. That being said, more recent research indicates that very few circumstances lead to negative effects of goitrogenic foods on the thyroid. Basically, consuming only very large amounts of raw goitrogenic foods will cause an issue for those with thyroid disorders. Most of the time, the bok choy benefits will outweigh the thyroid concerns. But, if you do suffer from thyroid issues, it is still a good idea to speak with your doctor before eating bok choy. You can also integrate bok choy into your diet slowly to ensure that negative side effects do not arise. “Cabbage, Chinese (pak-choi), cooked, boiled, drained, without salt Nutrition Facts & Calories,” SELF Nutrition Data; http://nutritiondata.self.com/facts/vegetables-and-vegetable-products/2378/2, last accessed March 1, 2017. Ware, M., “The Health Benefits of Bok Choy,” Medical News Today, October 31, 2016; http://www.medicalnewstoday.com/articles/280948.php., last accessed March 1, 2017. Thompson, C., “Bok Choy: 10 Fun Facts,” WebMD; http://www.webmd.com/food-recipes/features/bok-choy-10-healthy-facts, last accessed March 1, 2017. “Bok Choy Nutrition Facts,” Nutrition and You; http://www.nutrition-and-you.com/bok-choy.html, last accessed March 1, 2017. “What Is Bok Choy Good For?” Food Facts Mercola; http://foodfacts.mercola.com/bok-choy.html, last accessed March 1, 2017. “5 Things You Need to Know About the Health Benefits of Bok Choy,” LIVESTRONG; http://www.livestrong.com/article/347198-list-of-cruciferous-vegetables/, last updated May 27, 2015. Wells, K., the wellness mama cookbook: 200 easy-to-prepare recipes and time-saving advice for the busy cook (Rockfield, Harmony Books, 2016), 114. Miller, R., “Stir-Fried Bok Choy with Ginger and Garlic,” Food Network; http://www.foodnetwork.com/recipes/robin-miller/stir-fried-bok-choy-with-ginger-and-garlic-recipe, last accessed March 1, 2017.